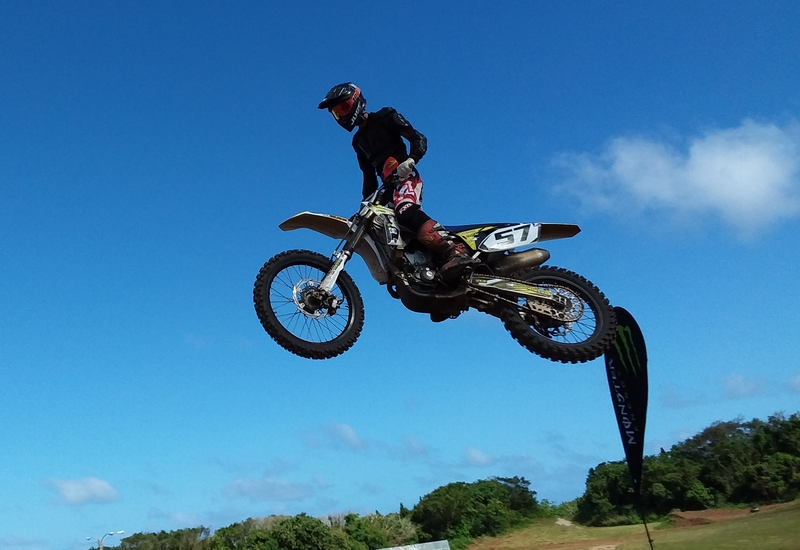 PRESS RELEASE – This past Sunday round 1 of the ten round 2019 Monster Energy Guam Motocross Championship was held at the Guam International Raceway located in the northern village of Yigo. The field of competitors included both several mini bike youth classes ranging from ages 4 years up to 15 and by several full sized machines of the Open Atv and Motorcycle classes that saw competitors ages ranging from 16 years and up. Racing kicked off at just before noon. In the Open Motorcycle division an added excitement was injected into the event with the return of multi time Open Motorcycle Guam champion #7 JR Cepeda after a two year break from the Guam championships. Reigning Guam Open Motorcycle champion KTM mounted #31 Tim Wenden and Yamaha rider #1 “lil” John Aguon were the odds on favorites to take the round win both looking very strong during the earlier weeks practice sessions. With much hype and anticipation of this being the race to watch at a high level just because of the two favorites Aguon and Wendens past history for heated on the track battles but to now include the former champ Cepeda injected into the mix plus to also include a host of hungry up coming hard charging rookies that track saw spectators lining the course for the best view possble..
At the drop of the gates of the first of two 20 minute heats that would determine the round 1 overall champion it was #7 JR Cepeda aboard a Yamaha jumping out to the lead with “lil John Aguon close on Cepedas rear fender shadowing the former champ as they hammered through the course. The course itself was in fantastic form for the event and was both exciting on the riders with its high flying jumps and brutal with its many humps, bumps and switchbacks. With Cepeda and Aguon up front midway into the heat the battle for third was taking shape with #55 Carlo Pangelinan holding the position and #11 Mike Limtiaco close in fourth and #57 Blaze Aiken plowing forward from tenth place up to fifth. It didn’t take the momentum of the #57 of Blaze Aiken long to over take the #11 of Limtiaco and then put his sights on his next victim the #55 machine of Pangelinan. The two battled back and forth for position with the #55 of Pangelinan finally relinquishing to the constant assaults being paid out by the #57 of Blaze Aiken who now comfortably held the third place position. At the checkers it was the #7 of JR Cepeda taking the heat 1 win with “lil” John Agoun in second and #57 Blaze Aiken in third. Unfortunately #31 Tim Wenden had to withdraw from the event and was missed out on the track. Once again it was the #7 of JR Cepeda taking the early lead off the start and pulling away from the pack early on. Running second was #11 Mike Limtiaco with #55 Carlo Pangelinan in third, #57 of Aiken in fourth, and #75 Jeff Rios in fifth. Getting a bad start and having to put on a charge to get up front to join the early heat leaders was #1 “lil” John Aguon. Aguon took his Yamaha and proceeded to cut the field to pieces as he sliced his way through the course eventually positioning himself right behind the leader Cepeda with just minutes left in the heat. Aguon seemed to be in a zone where he would not be denied the win as he pulled up next to and then powered away from Cepeda to take the heat 2 win and the round 1 championship. Taking second was Cepeda with Aiken in third. Fourth place went to Mike Limtiaco with Carlo Pangelinan in fifth. Rounding out the top ten respectively were #75 Jeff Rios, #51 Frank Rios, #24 Jon Aguon, #49 Jordan Leon Guerrero, and #2 Stan Yasuhiro. In the Open Atv class #75 George Santos on a Yamaha took the first heat win with #4 Robert Bucek aboard the Cyclesplus Suzuki taking the second heat win and therefore the round 1 overall win. The #75 of Santos took second with #15 Albert Garlit in third on his Kawasaki. Yamaha mounted #64 “little” George Santos took fourth place overall with #88 Camilo Lorenzo in fifth aboard his Yamaha. In the Open Minibike class KTM mounted #22 Wyett Santos took the first heat win with Kawasaki mounted #25 Lawrence Limtiaco in second and #31 Richard Wenden in third on a KTM. It was the #25 of Lawrence Limtiaco dominating and taking the heat 2 win and the round overall championship with Santos in second overall and Wenden in third overall for the round. 65cc Kids Minibike class saw #21 Jessani Leon Guerrero taking the win with #33 Mariana Wenden in second. 50cc Kids Minibike class saw #1 John Aguon on a KTM take the win. In the Over 40 Vet class #11 Mike Limtiaco took first with #75 Jeff Rios in second, #51 Frank Rios in third, fourth was #2 Stan Yasuhiro and #25 Larry Limtiaco in fifth. In the 250cc class #57 Blaze Aiken took the win with #55 Carlo Pangelinan in second, #51 Frank Rios in third, #24 Jon Aguon in fourth and #49 Jordan Leon Guerrero in fifth. In the 450cc class #1 “lil” John Aguon took the win with #7 JR Cepeda in second, #11 Mike Limtiaco in third, #75 Jeff Rios in fourth, and #2 Stan Yasuhiro in fifth. Next on the motocross calendar will be two exciting weekends of tight and twisted motocross racing next to the Umatac bridge in celebration of this years Guam Heritage celebration. The first will be held on Saturday February 23rd and the second race will be on Sunday March 3rd. Riders meeting at 9am on both dates with racing getting started shortly there after. Next on the championship motocross race schedule will be round 2 of the six round 2019 Monster Energy Guam Motocross Championships and will be held on Sunday March 17th at the Guam International Raceway home of the Jose and Hermenia Calvo Memorial Off road Park. Gates open at 8am and the racing kicks off at 11:30am. Everyone is invited to attend to watch free of charge. Interested new or experienced riders are encouraged for more information to visit https://girmac.teamapp.com or contact public information officer Robert Bucek by call or text at 727-5381. #25 Lawrence Limtiaco took the Open Minibike class round 1 win. #1 Lil John Aguon took the Open Motorcycle class round 1 win. #1 Johnny Aguon took the 50cc Kids Minibike round 1 win.